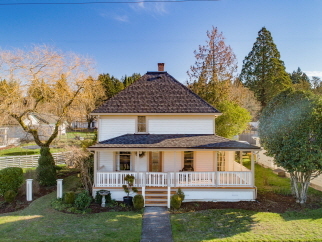 This beautifully maintained home has all the charm of yesteryear! Brazilian hardwood floors are though out most of the home including living room and dining room. Country kitchen with double sink, tile floors and counter. Library on main with built-ins. Upper level features two bedrooms, hardwood floors and sitting area. Fenced backyard with custom playhouse, tool shed and parking from alley. Blocks from schools, stores and public transportation. This home is an absolute charmer! Interior Features Hardwood floors; built-ins; country kitchen; library; sitting area. Exterior Features Fenced yard; wrap around porch; custom play house; tool shed. Additional Features and Amenities Two heat pumps; zonal heating; nearby schools, stores and public transportation.